When the event is great, the arena where it takes place should match the standard to make the occasion an unforgettable one. The Oracle is an indoor arena at Oakland California and organizes a number of events throughout the year. Initially constructed as Oakland Alameda County Coliseum Arena in 1966, the arena was built keeping in mind the multi-purpose usage. With the seating capacity of almost 20,000 spectators, the Oracle Arena is known for its largest seating capacity in California State. It is also known as one of the oldest facility still in use by NBA. Nothing should keep you away to enjoy some of the finest events scheduled here! Grab Oracle Arena tickets now for a time worth remembering. Oracle Arena has a shining history as it served as the home of Golden State Warriors since 1971. It took a year off when the arena had to undergo renovations. Some of the noted teams have also played their games at the arena which includes Harmon Gym and California Seals. California Seals were stated as the first tenants of the arena who shifted from Cow Palace. The notion behind this move was the fact that the team will be give an expansion franchise if they move to Oracle Arena (then named as Oakland Coliseum Arena). The team later changed their name as California Seals from San Francisco Seals with the intention to capture the crowd of San Francisco and California. The team continued playing at the arena till they moved to Cleveland in 1975-76. As the arena gained fame, it also experienced wear and tear which called for renovations. The major factor that forced renovations was the lack of facilities that many newer arenas had and the seating capacity of 15,000 seats also needed some change as many top class arenas had far more capacity than Oracle Arena. Instead of building a new arena, the idea was to renovate it and thus much of the interior was changed and the seating capacity was created. The interior of the arena was rebuilt in 1996-1997 thus giving it an entirely new look. The external walls, foundation and roof remained the same, just the way Key Arena in Seattle was done. The new LED score board hung at the center of the arena added to the glory of the renovated arena. The new seating arrangement can now accommodate almost 20,000 audience for basketball and around 17,000 for ice hockey. Gather your friends and family and grab Oracle Arena tickets now for a gripping event hard to forget. Do not miss the chance this season and assure your presence to have the most amazing time! The average Oracle Arena Tickets price will cost you between $109 and $638, if you are looking for the cheapest seats then catch the event being held at the Oracle Arena, Oakland on 17/10/2019. The average ticket will cost you the highest on 09/04/2020 at the Oracle Arena, Oakland. Minimum get in price is for Oracle Arena Tickets is $37 for the event being held at the Oracle Arena, Oakland on 03/06/2019 , there are some venues that have a much higher get in price, for instance the cheapest seats at the Oracle Arena, Oakland on 09/04/2020 will set you back $140. 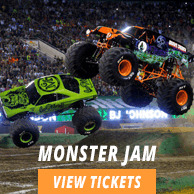 Can I buy disney on ice for oakland 2019 tickets directly from the arena? Can I pay for my disney toy story 3 oakland tickets with cash? Where can i compare prices of all the sade and john legend memphis tn tickets at your site? Will there be seat numebsr written on oracle arena tickets? Whats the date for eddie izzard oracle arena show? Yes, you can buy your Oracle Arena Tickets directly from the designated counters at the venue. No, we don't accept cash do you will need to use a card to pay for your Oracle Arena Tickets. Oracle Arena Tickets page on our site will give the price list you are looking or. Oracle Arena Tickets do not have seat numbers written on them. Kindly see our Oracle Arena section for Eddie show details.